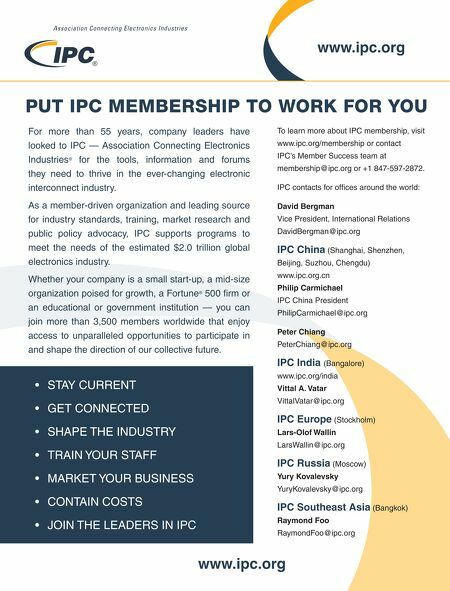 PUT IPC MEMBERSHIP TO WORK FOR YOU To learn more about IPC membership, visit www.ipc.org/membership or contact IPC's Member Success team at membership@ipc.org or +1 847-597-2872. IPC contacts for offices around the world: David Bergman Vice President, International Relations DavidBergman@ipc.org IPC China (Shanghai, Shenzhen, Beijing, Suzhou, Chengdu) www.ipc.org.cn Philip Carmichael IPC China President PhilipCarmichael@ipc.org Peter Chiang PeterChiang@ipc.org IPC India (Bangalore) www.ipc.org/india Vittal A. Vatar VittalVatar@ipc.org IPC Europe (Stockholm) Lars-Olof Wallin LarsWallin@ipc.org IPC Russia (Moscow) Yury Kovalevsky YuryKovalevsky@ipc.org IPC Southeast Asia (Bangkok) Raymond Foo RaymondFoo@ipc.org • STAY CURRENT • GET CONNECTED • SHAPE THE INDUSTRY • TRAIN YOUR STAFF • MARKET YOUR BUSINESS • CONTAIN COSTS • JOIN THE LEADERS IN IPC www.ipc.org www.ipc.org For more than 55 years, company leaders have looked to IPC — Association Connecting Electronics Industries ® for the tools, information and forums they need to thrive in the ever-changing electronic interconnect industry. As a member-driven organization and leading source for industry standards, training, market research and public policy advocacy, IPC supports programs to meet the needs of the estimated $2.0 trillion global electronics industry. Whether your company is a small start-up, a mid-size organization poised for growth, a Fortune ® 500 firm or an educational or government institution — you can join more than 3,500 members worldwide that enjoy access to unparalleled opportunities to participate in and shape the direction of our collective future.